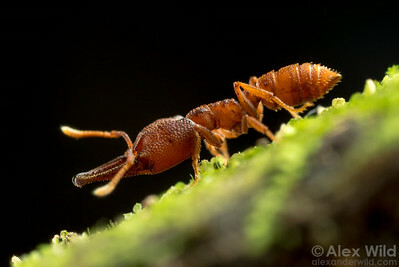 is a rarely seen amblyoponine ant sporadically encountered in the old world tropics and subtropics. 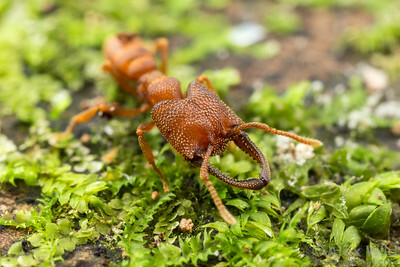 These strange insects have a snap-jaw that can strike at 200 miles per hour, the fastest known motion among all animal species. 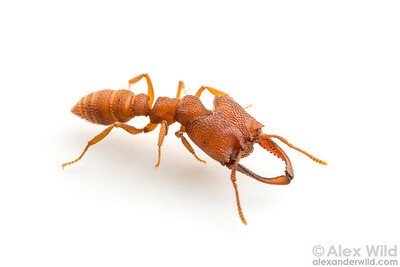 Mystrium ants have clubbed mandibles capable of striking with tremendous force when released. 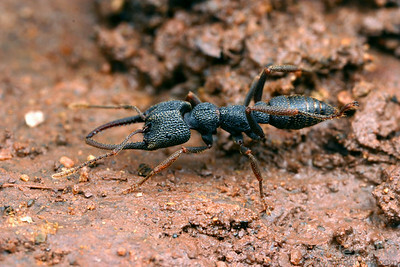 Laboratory animal at the University of Illinois, collected in Maliau Basin, Borneo. 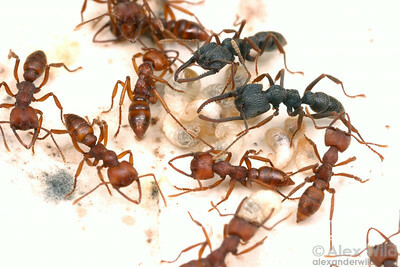 Laboratory colony at the University of Illinois, collected in Maliau Basin, Borneo. 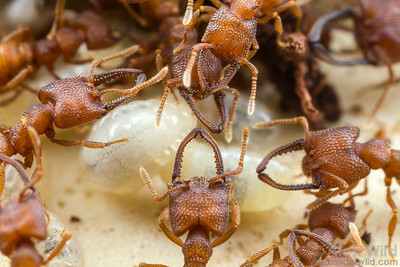 Worker ants tend to larvae in a laboratory colony at the University of Illinois. 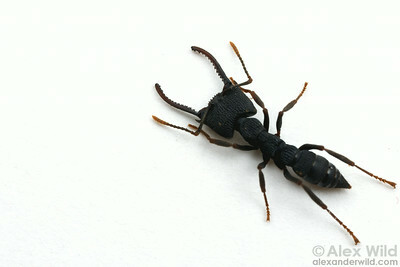 Collected in Maliau Basin, Borneo. 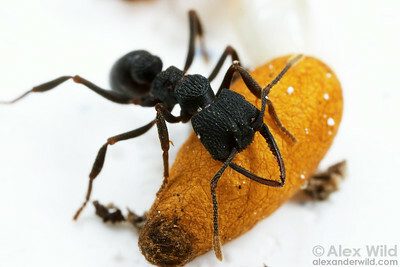 Portrait of a major worker. Laboratory colony at the University of Illinois, collected originally in Maliau Basin, Borneo. 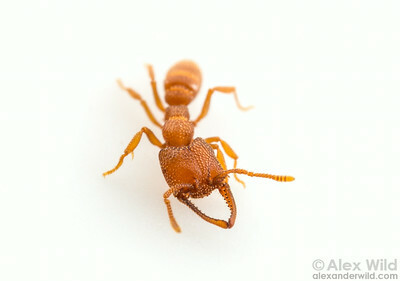 Colonies of the rare amblyoponine genus Mystrium have workers of different sizes and body proportions. 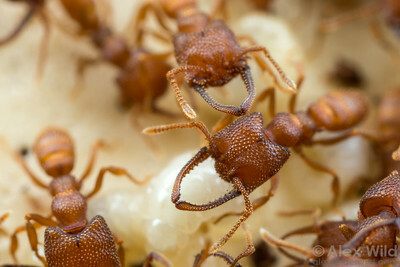 Laboratory colony at the University of Illinois, originally collected in Maliau Basin, Borneo. 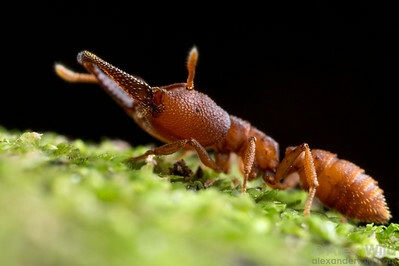 Portrait of a minor worker. Laboratory colony at the University of Illinois, collected originally in Maliau Basin, Borneo. 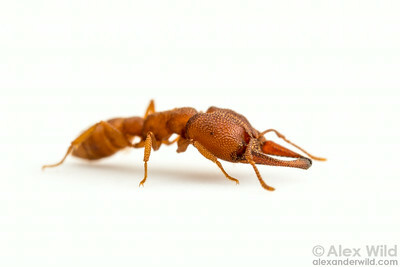 Dracula ant. 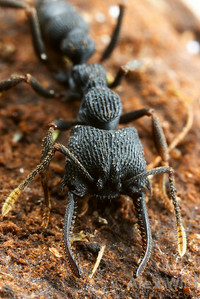 Maliau Basin, Borneo. 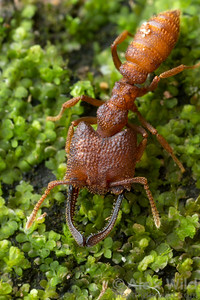 Worker dracula ants tend to brood in a laboratory colony at the Unversity of Illinois, where the biomechanical properties of their unusual mandibles are being studied. Maliau Basin, Borneo. 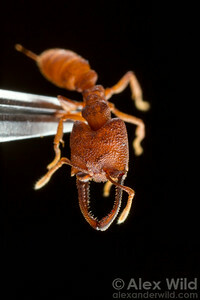 This Mystrium worker is used for studies on the mechanics of ant mandibles at the University of Illinois. Originally collected in Maliau Basin, Borneo. 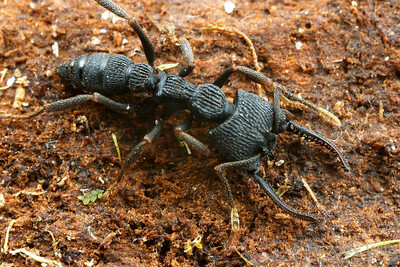 Mystrium voeltzkowi has an unusual caste system. 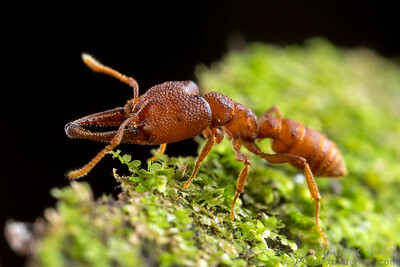 These ants are dimorphic, with a small red caste that appears to work mostly in the brood nest and a larger, dark caste that performs most of the foraging and guarding of the nest. 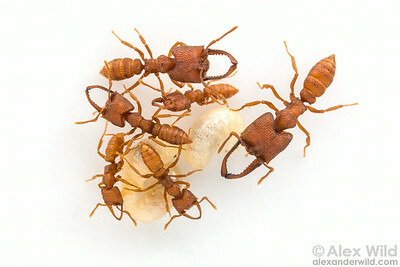 Interestingly, the ants that perform as reproductive queens are drawn from the smaller caste. Madagascar.